A simple, easy and nice display of the current date and time using AJAX scripting. It includes various display formats to choose from based on your preference. It supports all countries date and time formats. ^ The translation (.ini) files have been updated. ^ [Improvement] the online_text + offline_text variables have been removed. # Some language strings have been improved at the backend.
! The 'Color' module parameter has been removed. + The 'Custom CSS' module parameter has been added. Now you can add easily your own CSS inside the module params, without editing any of your CSS files. ^ Option to display the $week variable (e.g. Week: 26) into your code. You just have to enter the into the file "default.php" [Thank you, Gerald Berger]. # Bug Fixed: PHP Fatal error: Redefinition of parameter $offset in \modules\mod_datetime\helper.php on line 118. + Dutch (nl-NL) language has been added. Many thanks to Henk Gordebeke. ^ French language files have been updated. Many thanks to Sandra Thevenet and Marc Antoine Thevenet. ^ Italian language files have been updated with corrections. Many thanks to Lorenzo de Mauro. + The date format parameter list has been updated. The below joomla! date format options have been added, based on your language file (DATE_FORMAT_LC, DATE_FORMAT_LC1, DATE_FORMAT_LC2, DATE_FORMAT_LC3, DATE_FORMAT_LC4, DATE_FORMAT_LC5, DATE_FORMAT_JS1). [Many thanks to Radovan for his suggestion]. + A new input parameter has been added to adjust the date format if none of the options in the list does fit your needs. ^ Language files have been updated. # Bug Fixed: The front and the end text, are not displayed. # Bug Fixed: Issues with UTC time from towns like Kolkata, Adelaide, Bengaluru, Mumbai, Tehran, Darwin, Caracas, Kabul, and others, have been resolved. ^ Compatible with HTML5 datetime Attribute. + CSS file added mod_datetime/tmpl/default.css. + Russian (ru-RU) language has been added. Thanks bizt, https://www.web357.com/forum/question/2144-solved-translite-russian. + Language Added: Portuguese (Brazil) [pt-BR]. Thank you so much, Edimar Pereira. # BUG Fixed: If the option "19:32 (ajax/flashing)" has been selected, the am/pm did not display properly. + Language Added: The French language has been added, by Henba. Before & After text (You can insert html text in front or at the end of date and time). Time Zone (You can use multiple copies of datetime module, from different time zones, to display the time from more than one Countries in one single page.). 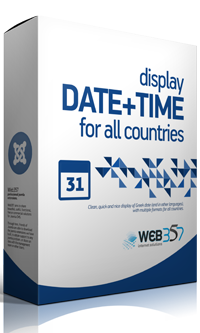 Date Format (You have a plethora of options to display the date format that match for your Country). Date Format Separator (Some dates are written with dot 13.04.2015, or slash 13/04/2015, or dash 13-05-2015 etc.). Time Format (Static or ajax/flashing format, e.g. 08:44:12 PM). Display PM/AM (You have the option to display or hide the PM/AM right of the time). Custom CSS (Enter your custom CSS code). Compatible with the Igbo calendar (The Igbo calendar is the traditional calendar system of the Igbo people from present-day Nigeria. The calendar has 13 months in a year (afo), 7 weeks in a month (onwa), and 4 days of Igbo market days (afor, nkwo, eke, and orie) in a week (izu) plus an extra day at the end of the year, in the last month. Example: Monday, Nkwọ 08 October 2018.). Excellent & Super easy to use. Immediate response to all my question. Even in holiday time! Works as advertised. Very easy to install and set up within my client's Joomla website. Developer got back to me when I had a question within a few hours. Very helpful. Was to the point and very easy to follow. Does what it says on the tin. Support is fast and brilliant. I emailed my request and although it a free component, the developer updated the module in a couple of hours. Brilliant.